This certified training program is intended to provide drug test administrators information to better understand the Premier Bio-Dip product and testing procedure. Please read through all of the information within this training program. After completing the training portion, you may test your knowledge with our online certification quiz. Once you have successfully passed the quiz with 100% accuracy, you will receive a personalized certificate of training which you can print for your records. The Premier Bio-Dip is a preliminary screening test for the presence of drugs. 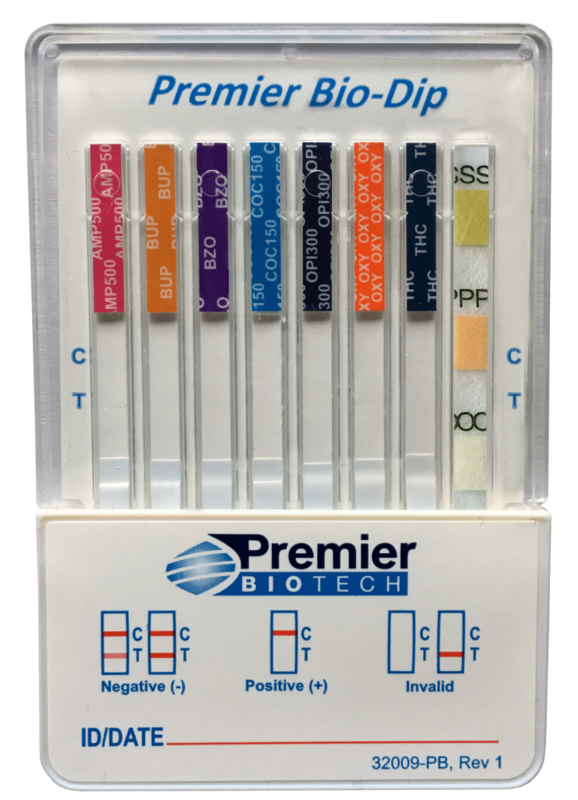 The Premier Bio-Dip is a qualitative, immunoassay urine based rapid test that can test for multiple drugs simultaneously. The strips are hermetically sealed and flood proof allowing walk-away capabilities to the collector, even when submerged in the sample. The Premier Bio-Dip offers the ability to test for the most relevant drugs of abuse with up to 60-minute result stability. Ability To Test For Specialty Drugs: K2/Spice, Tramadol, Fentanyl, EtG, Alcohol, etc. The “Cutoff Level” is the concentration level established as a break-point or threshold for labeling a result positive or negative (e.g. 500ng/mL AMP or 100ng/mL COC). The concentration of a drug is expressed in nanograms (ng) per milliliters (mL) or ng/mL. One nanogram is equal to one billionth of a gram and 1mL is equal to about 1/30 of a fluid ounce. The Premier Bio-Dip device should be stored at room temperature (15-30 degrees°C/ 59-86 degrees°F). Carefully inspect the foil pouch to ensure there are no tears, cuts, or damage to the packaging. Check the lot number and expiration date. Do not use if past the expiration date. The expiration date of the device is good through the last day of the month noted on the pouch. Example: 2018-06 = June 30, 2018. Instruct donor to wash hands in your sight BEFORE donating a sample in order to remove any residue that may interfere with the specimen collection. Remove the dip card from the sealed pouch. Hand the collection cup to the donor and request they provide the urine specimen. At this time, check the temperature strip to make sure the specimen is within normal range. The temperature of the specimen should be within 90-100 degrees Fahrenheit. If the temperature of a specimen is not within normal range, the specimen should be considered invalid and another sample should be collected. Next, remove the cap from the Premier Bio-Dip to expose the strips. The strips on the Premier Bio-Dip are hermetically sealed inside a protective, flood-proof plastic cover. With the arrows pointing toward the urine specimen, immerse the sample tips vertically in the specimen. The Premier Bio-Dip has walkaway capabilities, even when submerged in the sample. This allows the collector to leave the Premier Bio-Dip submerged in the sample or the cap may be replaced. 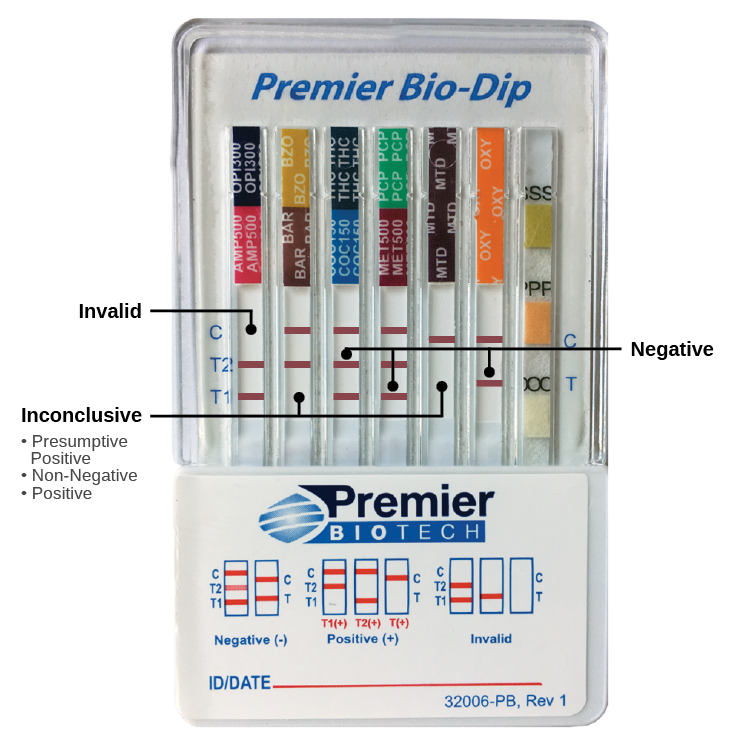 The Premier Bio-Dip may contain multiple drugs per strip, followed by the individual drug test strips. Two lines appearing show a negative result. Negative results may be read as soon as the top control line and bottom test line or lines appear. Any test line regardless of the intensity, color or size, is a line and indicates a negative result. It is normal for line intensities to vary for different drug strips. An Inconclusive result (also may be identified as positive, presumptive positive, or non-negative) is indicated by only the top control line present and the absence of a bottom test line. Read Inconclusive results at 5 minutes. The multi-drug strips consist of the top control line (C) and two test regions labeled (T1) and (T2) below representing each of the drug test strips. 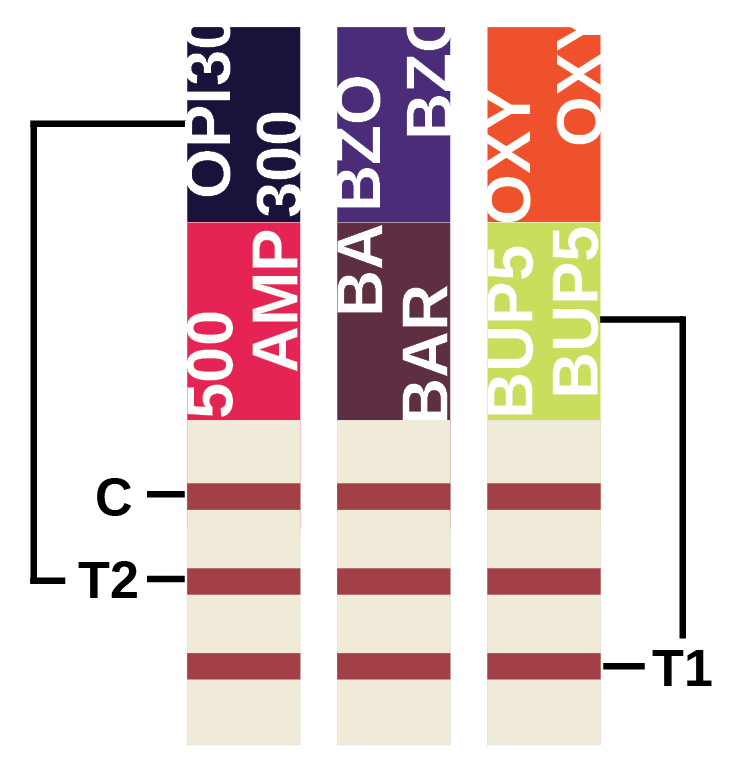 Within the diagram below, (T2) corresponds with OPI, BZO and OXY, while (T1) test lines correspond with AMP, BAR and BUP. 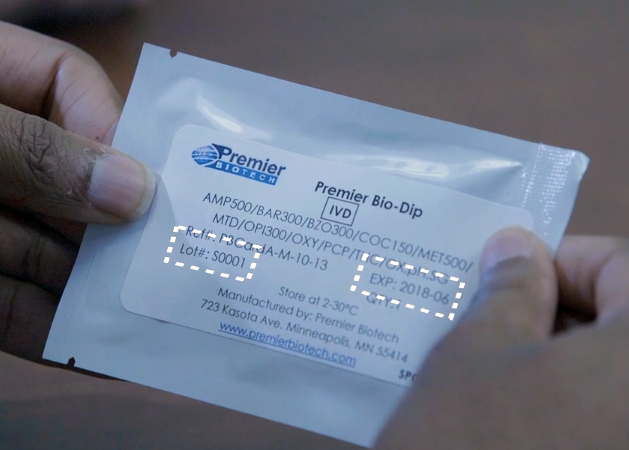 The Premier Bio-Dip may come with specimen validity testing. The Premier Bio-Dip specimen validity test is based on the color response of chemical indicators in the presence of adulterants. Specimen validity tests help to determine the integrity of a urine sample. 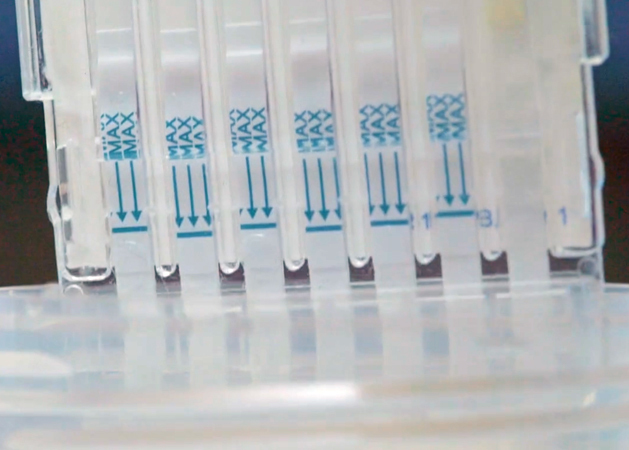 Read the specimen validity test results by visually comparing the color of the reagent pads to the corresponding color blocks on the specimen validity color chart at 3 to 5 minutes. Pad colors that change to a color NOT found listed in the normal range are to be read as abnormal. You have now completed the Premier Bio-Dip training. You may go back over any or all of the material above anytime. Once you feel confident with the material presented, you may proceed to the certification quiz by clicking the button below. After you complete the quiz with 100% accuracy, a certificate will be generated on your screen that you may print for your records.